Mitt Romney's presidential campaign is in trouble, and according to New York Times columnist Charles M. Blow, the responsibility lies squarely between Republican politics and Romney himself. Following the now infamous 47 percent video, on which Romney describes most Americans as loafs who refuse to care for themselves, President Barack Obama is leading in many polls, and Blow says this is because the Republicans find it acceptable to disregard facts. This is just an extension of the Republican war on facts. If you find a truth disagreeable, simply deny it. Call it corrupt. Suggest that it is little more than one side of a story — an opinionated, biased one — and insist that there is another explanation. The base will buy it. Let's just call this Operation Ostrich. 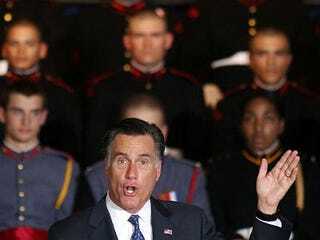 The real problem that has caused this very real turn in the polls has another name: Willard Mitt Romney. It is, in part, because of his convention that didn't congeal and, in part, because of his own missteps and misstatements, the most devastating of which was the secretly recorded tape of him dismissing 47 percent of the population: "I'll never convince them that they should take personal responsibility and care for their lives." Mother Jones magazine on Thursday posted a new video of Romney from 1985. In this one, he said that Bain Capital's mission was to "invest in start-up companies and ongoing companies, then to take an active hand in managing them and, hopefully, five to eight years later, to harvest them at a significant profit." And what about the people who might lose jobs in the process? Read Charles M. Blow's entire piece at the New York Times.